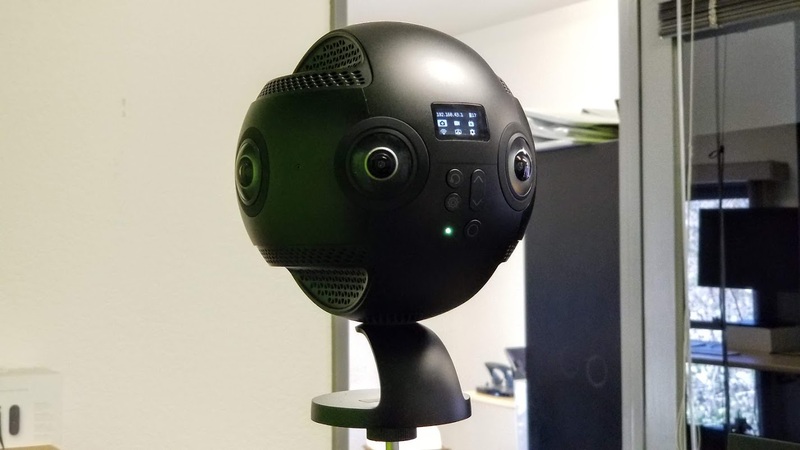 This post will give a quick introduction to spherical media and why VR is the best way to view it, then give our review of a spherical camera, the Insta360 Pro from Insta360. We’ll also show how easy it is to add spherical media to VR presentations using Vizible, our no-coding VR creation and conferencing software. Photospheres, also called 360 photos or spherical photos, are images that are captured in all directions at once or stitched together from individual photos, and videospheres are the same but, you guessed it, they’re videos. Photospheres and videospheres provide a powerful and easy way to immerse your audience in a place, whether you’re showing off a property, doing location-specific training, or simply providing a background for the rest of your VR experience. Virtual Reality is a natural medium for viewing photospheres and videospheres because people in a VR headset can look around simply by moving their head, just as they look around normally. When using a display like a desktop or smartphone, you can only “look around” photospheres by doing things like dragging a mouse, sliding a finger, or tilting a smartphone. While those methods work, it’s not as intuitive and natural as looking around in VR. VR also lets viewers explore stereoscopic photospheres and videospheres. Stereoscopic media is created by presenting two offset images separately to the left and right eye of the viewer. These images are then combined in the brain to give the perception of 3D depth. Because VR headsets provide one display for each eye, they let users view stereoscopic media and better experience the illusion of 3D depth. The Insta360 cameras are designed to capture VR-ready media, and if you want, their camera can automatically stitch together stereoscopic 3D images and videos. Now, let’s get into the camera. The Insta360 pro is a versatile camera with six lenses that lets you capture media in a few resolutions (8K, 4K), and even lets you live stream 360 media to major streaming platforms or their own servers. You can also capture slow-motion video. The camera has four built in microphones that capture spatialized audio, but you can also use an external mic. For storage, the camera has an SD drive or you can use USB 3.0 driver. The camera has a sturdy aluminum build, and it has a sci-fi look to it with a spherical shape and glossy shine. More than a few people in the office noted the comparison to the lovable, round droid from Star Wars, BB-8 (or to those who noticed it in the movie, BB-8’s darker, First Order counterpart: BB-9E). Take a look at some of the sample downloadable photos and videos from the Insta360 website to see how photos and videos look at different resolutions. We captured quite a few around the office and were impressed by the results. 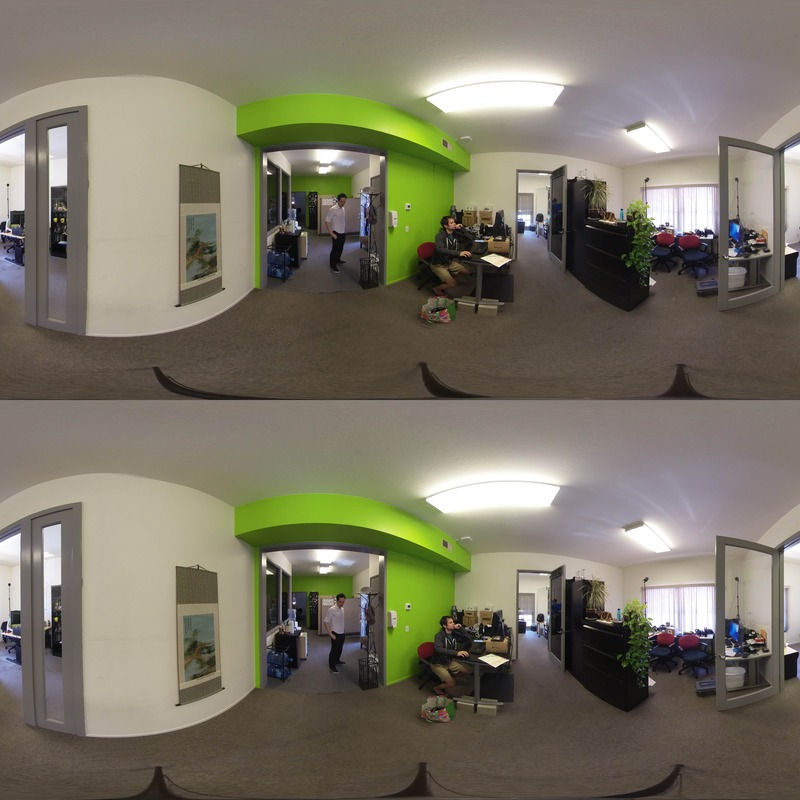 Here’s a stereoscopic image we captured at WorldViz HQ. Because this image is stereoscopic, there is one render for the right eye and one for the left eye displayed in what is called the "over/under" format. We also captured video at a warehouse nearby and we were pleased with the results. All in all, the Insta360 Pro is arguably the premier 360 camera on the market today. If the price is out of your budget ($3,499 currently on their website), it’s worth noting that Insta360 also makes smaller, more affordable cameras that still pack a punch. The Insta360 One is $299 and can be used with a smartphone. If you don’t need all of the bells and whistles on the Insta360 Pro, it’s worth checking out. There are a number of ways you can view 360 photos in VR, but we were interested in seeing how easy it was to bring them into Vizible, our no-coding VR creation and collaboration software. This way, our users can incorporate them into VR presentations and show them to an audience during Vizible VR meetings. Or, once you’re inside a Vizible VR meeting using your Presentation, you can expand out the spheres manually using the remote tool. Here’s a video of what that looks like. All in all, we found the Insta 360 Pro to be a tremendous camera. We’re happy to recommend this camera to Vizible users who are interested in capturing high quality 360 photos or videos for use in their VR presentations and collaborative meetings.